Father’s Day advertising hasn’t even started and I’m anticipating. So much that I offer this homage to my Daddy as I proudly called him for 50 years. He died on February 19, my sister’s birthday, in 2002. My sister’s birthday happens to be eight days after my own. Surely a coincidence that my father’s birthday was May 1. Four of four of us were born within nine months and change of that date. I like to consider us his birthday presents. Daddy was a mathematician. He loved order, rigor, and control. I remember seeing him with his flashlight, just after midnight, counting the number of night-blooming cereus blossoms outside my bedroom window. 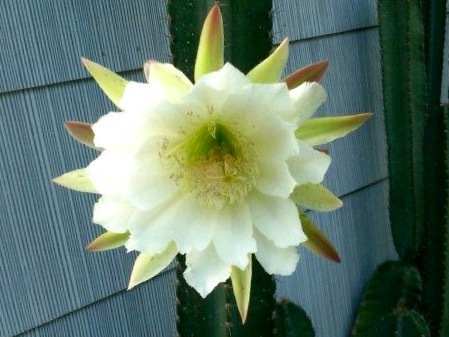 Supposedly, these cacti bloom once a year and for only one night. Ours was so old the staggered blooms lasted several. Flowers closed and died with the first rays of sun; but for one night, they shone like beacons from another planet. Daddy’s way of honoring the annual explosion was to go outside and count them when midnight hung hot and humid, the air liquid around his face. A blossom from a piece of the cactus cut from the monster at my parent’s home on Serpentine Drive South, St. Petersburg, Florida. I also maintain the antique practice of recording my gasoline purchases. I note the date, my mileage, the gallons, and the price. I scan back to check what I paid for a similar quantity when. Every time, I feel my father’s smile of approval. Daddy always, always, recorded his gas purchases. He also did the algebra to calculate miles per gallon. I don’t always take that extra step. But I record the data, in honor of him. Actually, I was almost never thinking that, but once he brought up the subject it was a complete mystery to me. One car appears to have been heading directly off the Interstate overpass while the other car had been driving backwards really fast on the other side of the highway. By the way, now that he and Robert are gone, you are the only one in the family left qualified to play the “equations off license plates” game on car trips.